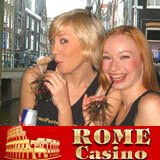 RomeCasino.com's recent venture to the Casino Affiliate Convention turned quite a few Dutch heads as the beautiful Romegirls, or ragazze di roma as they are known, toured Amsterdam. The girls travelled to clubs, coffee shops, and cruised the canal meeting locals and tourists alike. In keeping with the Roman gambling spirit, they put their newfound acquaintances to the test in a public game of Truth or Dare. The game took a turn for the interesting after a trip to Abraxas Coffee Shop, near the Red Light District, where a tray full of hash muffins lead to streaking through the streets and a slew of shots. Two lucky winners were able to take home the first in a long line of all-expense-paid trips to Rome, courtesy or RomeCasino.com. Witnesses claim that the winners took home slightly more then that. "We're bringing an entirely new level of gaming to the table," said Josh Cartu of RomeCasino.com. "We plan to foster an environment that brings a face to online gaming. The community we are creating gives our players not only a place to win money, but also many chances for life changing experiences, like our trips to Rome." The entourage was in town to announce Rome Casino 's latest promotion, which hails to be one of the largest deposit bonuses the online gaming industry has seen. The $1,000 bonus is part of Rome Casino's unique approach to multi-leveled bonusing, which allows the end user to continue to receive bonuses up to their 5thdeposit. Back at the Casino Affiliate Convention, Rome Partners debuted their affiliate software, which eases the normal frustrations of obtaining and implementing creative, as well as offers easy to understand, yet detailed reports. "We’re building strong partnerships with an array of affiliates based on our ability to create enticing offers, as well as our willingness to adapt to the needs of our affiliates," said Mati Gross, Affiliate Program Director for Rome Partners. “Rome Partners is also paying for a weekend of fun with the Rome girls for all our affiliates in Rome in the very near future. We recognize the need for our affiliates to share ideas amongst themselves and with us, to increase our ability to communicate with the end user." Click here for photos from the Rome Casino girls' trip to Amsterdam.